Good Passports, BoozeMenus and Yelp NYC have teamed up to present the Good Tequila Passport, which will raise funds for The Barman’s Fund & Holy Apostles Soup Kitchen. By purchasing the Good Tequila Passport, you’ll get one tequila / mezcal cocktail or a neat or rocks pour of tequila / mezcal at each location. Cocktails are based on 1 oz pours of liquor. You can use the passport on any day, at any time from July 1, 2016 through September 5, 2016. While you’re enjoying the Good Tequila Passport, you’ll get to try tequila drinks made with 123 Tequila, a small-batch, all organic distiller making spirits from the roasted heart of the Blue Agave. 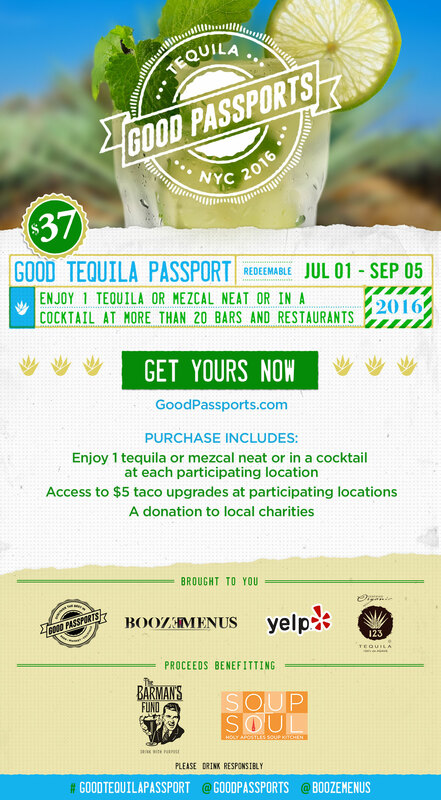 Several of the locations participating in the Good Tequila Passport are offering you a $5 Taco / Nacho upgrade+. Just present your Passport and ask for the Taco / Nacho upgrade. For $5 you’ll receive a special taco or nacho dish. When purchasing a Good Tequila Passport, choose the location where you would like to pick up your Passport. Passports are available for pick-up from July 1, 2016 through July 31, 2016. Pick up your Passport at the location you chose any day from July 1 through July 31, 2016. Bring your Passport to each of the participating locations any day from July 1 through September 5, 2016 and choose one cocktail or neat pour. Ask the bartender which cocktails or spirits you can choose from. Join us at our grand kick-off party, where you can redeem your drink 1 night early AND enjoy a $10 specialty cocktail featuring 123 Tequila all night! Meet and Greet the Brand Ambassador of 123 Tequila. A portion of the proceeds from the featured cocktail will support our charity partners. If you want to attend the kickoff event, you must choose the option to purchase one of the VIP tickets and pick up your Passport at Sweetwater Social during the party on June 30th between 6:00 p.m. – 9:00 p.m. The Barman’s Fund is a motley assortment of bartenders who pledge one shift a month and donate every last dollar you tip to local charitable organizations. Since 2011, we have started chapters in Austin, New Orleans, Charlotte, LA and more – and raised over $200,000 for folks who need it. So come plant your tail on a barstool, and drink with purpose! New York’s largest emergency food program, Holy Apostles Soup Kitchen serves a hearty and nutritious meal to more than 1,000 homeless, food insecure and those that just need a hand up. We recognize the hunger in our city goes beyond the need for food. At Holy Apostles we offer our guest refuge from the streets, a safe place they feel welcome, connection to additional service and food for the soul as well as the body. In over 35 years we have never missed a serving day and we have never turned anyone away from our door. Our mission is to feed the hungry, comfort the afflicted, seek justice for the homeless and provide a sense of hope and opportunity to those in need.